With a little belated inspiration from Valentines Day and a lot of inspiration from WAH Nails, I decided to have a play around with my Rio Nails pens & nail wheels on the weekend. I normally try to stick to a colour scheme and fail miserably as I get distracted by too many ideas to put onto nails.. but this time I've stuck to pretty girly colours, woo! For anybody that likes the look of nail art but is a little afraid to give it a proper go, leopard print nails are always a winner in my books - they're my favourites every time I put together nail wheels. I find that the more clashing the colours are that you pick for the spots/basecoat, the better the outcome - note: see pink nails with Essie 'Mint Candy Apple' splodges. you've put so much effort into this, they all look brill! i haven't tried any leopard print nails yet, i'm too scared to mess them up on my right hand. These are incredible! 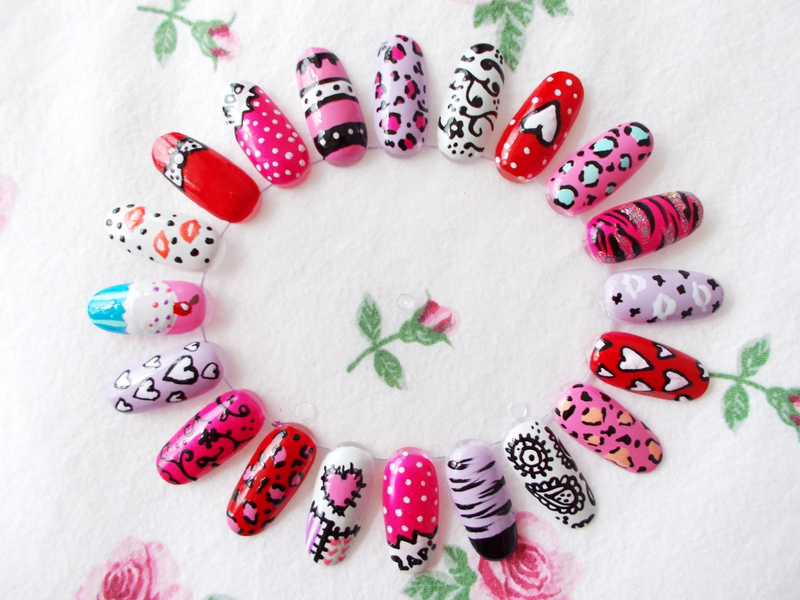 I love the heart designs!